The Millennium Falcon is a starship that first appeared in the original Star Wars film, A New Hope. It went on to play a major role in the two followup films (The Empire Strikes Back and Return of the Jedi respectively), and made a cameo in Revenge of the Sith. The Falcon is under the ownership of Han Solo, a rogue smuggler. It was once in the possession of Solo's close friend, Lando Calrissian. Piloted by Solo and his Wookiee friend Chewbacca, Solo won the ship from Lando Calrissian in a high-stakes game of sabacc. Lando had previously won the ship from an unknown person. The ship was chartered by Obi-Wan Kenobi and Luke Skywalker to deliver R2-D2 and the stolen Death Star plans to Alderaan. The ship is a heavily modified version of a YT-1300 Corellian Transport. When challenged by Obi-Wan about his ship's speed, Solo famously replied, "It's fast enough for you, old man." The ship is capable of attaining "point five past lightspeed." Han's famous comment, that the vessel "made the Kessel Run in less than twelve parsecs", seems a little incongruous, as a parsec is a measure of distance, not time. However, the factor that allowed Han to make the Kessel Run in record time was to cut extremely close to the Maw black hole cluster instead of taking the wide path around it. At sublight velocities, the Millennium Falcon is not a particularly fast vessel; Imperial Star Destroyers have been able to keep up with her. However, the Falcon was considerably more maneuverable than Star Destroyers. An example of this is when Han Solo used the maneuverability to elude three Star Destroyers that were trying to block them in and seemingly made them collide with each other. The Falcon's true strength involves the skill of her crew and her extraordinarily fast superluminal speeds, to which no manned vessel is known to compare. The cobbled-together nature of the ship presented many problems throughout the movies and the novels; systems were barely held together and apparently had many incompatibilities, a fact that didn't go unrecognized among the characters of the movies. "You came in that thing? You're braver than I thought!" was Princess Leia Organa's reaction at first sight of the Millennium Falcon, while Luke's appraisal of the Falcon was, "What a piece of junk!" During Imperial pursuit from Hoth the ship's technical difficulties—namely an inability to enter hyperspace—resulted in the ship and crew nearly being captured. Years after the Battle of Endor it appeared that Han Solo and/or Chewbacca were able to resolve these difficulties, much to the relief of one Leia Organa Solo. The resolution of those problems may have involved a virtual rebuild of her internal operation systems; this has never been discussed in detail. The modified Corellian freighter sports quad blasters startlingly reminiscent of World War II crew-operated turret machine guns, with the operator tracking targets optically (due to the high prevalence of electronic warfare in Star Wars) and swiveling along with the gun barrel. In Return of the Jedi, the ship is revealed to possess powerful armor-piercing missile weapons called "concussion missiles", which are illegal in the Star Wars universe for civilians (like smuggler pilot Han Solo) to possess. During the events surrounding the reborn Emperor Palpatine, the missile launchers were temporarily replaced by a giant lightning gun. Later refits, during her service as a New Republic diplomatic courier for the Skywalker-Solo family, who were highly placed in the New Republic in honor of their service to the Rebellion during the Galactic Civil War, included light turbolasers replacing her quad blasters. At least one pop-out repeating blaster is mounted to give some ground cover when the use of the heavier weapons is not warranted or possible. The ship has been captured by the Death Star's tractor beam and searched by Imperial Stormtroopers, who miss the crew and passengers hiding in the smuggling holds, which are shielded against most scanning equipment. It has also been piloted through asteroid fields, and on one occasion (miraculously) outran the massive explosion of the second Death Star. The ship played a vital role in both of the Death Star battles. In Episode III: Revenge of the Sith, the Falcon had a brief onscreen cameo appearance, but as a brand new, freshly-built state-of-the-art spacecraft. It can be seen in the lower right hand corner of the screen docking at the spaceport as Obi-Wan and Anakin are returning Palpatine to the Senate building on Coruscant. However, Han Solo was most likely not the pilot in this cameo, due to the dating supported by the Star Wars Expanded Universe and the fact that in Revenge of the Sith, Chewbacca is still on Kashyyyk. Most likely, the owner of the Falcon previous to Lando Calrissian is the pilot. Other ships of its class appeared in Attack of the Clones (they are briefly seen at the Naboo spaceport). In real life, the original model for the Millennium Falcon was changed at the last minute because it too closely resembled ships from the television series Space: 1999. The replacement is said to be based on a half-eaten hamburger held by George Lucas and the disused original design was further developed into the Corellian Corvette starship seen at the beginning of the first film. Starwars.com confirms the hamburger claim and also adds that Lucas referred to the cockpit of the Falcon as an olive on the side of a "flying hamburger". Like many science fiction spacecraft, the Falcon's interior sets cannot actually physically fit within the exterior sets. Subsequent extended universe plans are consequently a compromise attempt at squeezing the interiors in (often with detriment to headroom). 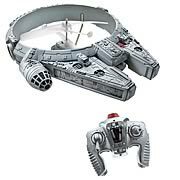 1/12, 1/18, 1/24, 1/43 scale Star Wars Millenium Falcon Diecast models from all the top manufacturers including AutoArt, Maisto, Bauer, Bburago, Minichamps, Motor Max, GMP, Road Legends, Motor City Classics, UT Models, ERTL, Kyosho, Signature Models, Precision Miniatures, Sun Star, First Gear, Exoto, Hotwheels, Welly, Highway 61,Greenlight, Jada Toys, Johnny Lightning, Ricko, Revell, Shelby Collectables.